Organized by the Board of County Commissioners, 24 March 1817 and named after Samuel R. Marrs one of the first Commissioners. Marrs came to Posey County from Warrick County of which he was the first sheriff. Samuel Marrs died in 1818. Named after Thomas and William Robb, the first settlers. The first boundaries of March 24 1817 included all of the present limits plus all of now Bethel and a greater portion of Harmony Townships. Formed and recorded 24 March 1817. Named after George Smith, one of the earliest settlers, the original boundaries included the present territory plus area that is now part of Lynn township and in Gibson and Warrick Counties. 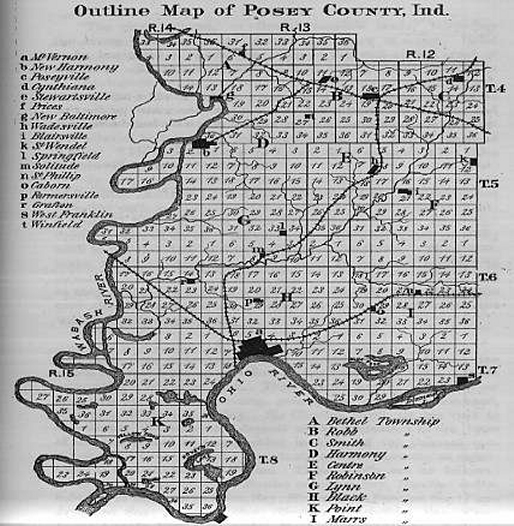 Smith Township was the first in the northern part of Posey County to have a rail line. In 1880 an extension of the E. & T. H. R. R. ran from Owensville in Gibson County to Cynthiana. At the time of forming, Lynn Township included part of now Harmony Township and the town of Harmonie (New Harmony). Named after Dan Lynn the first Representative of the County in the Legislature. Lynn was also a member of the Convention which adopted the Constitution under which the State was admitted to the Union. Black Township was named after three brothers, Hugh, William and Thomas Black, who were among the earliest settlers. The Township was organized on 24 March 1817 and included area that is now Point Township. Named after William Wagnon one of the earlier settlers of Posey County and organized in 1817. When Vanderburgh County was formed 7 January 1818 Wagnon Township became part of that county and is now Perry Township. Formed 14 August 1821 and named after P. C. Bethel, the first white man who settled within the boundaries of the Township. Located at the extreme northern part of the county. Organized 14 August 1821. Harmony Township received its name from the Harmonie Society that settled the area in 1814-15. Named after Jonathan Robinson the exact date of formation is not known having been formed in the first days of the Territory's history. Document records of Robinson and other Townships before were destroyed at Vincennes in January 1914 when the Register of the Territorial Land Department and its contents were burned. Jonathan Robinson was likely one of the first settlers of that area. Named for its central location in the county. Formed from parts of Robinson, Lynn and Harmony in March 1859. Organized from Black Township and from 14 August 1821 to 13 May 1822 it was known as Daniel Township. First named for John Daniel the first permanent settler there. Point Township was officially organized as Point on 13 May 1822. Point Township receives its name from the area where the Ohio and Wabash rivers come together. This account of Hoop-Pole Township is taken directly from "History and Directory of Posey County" (1882). As a great many of our readers have frequently heard the word "hoop-pole" applied to a township of this county, and as a majority of them perhaps do not know how it originated, we give the following version, hoping to disabuse the minds of a great many who may entertain the idea that such a township had actual existence. About fifty years ago, there was a large class of robust, fearless men who followed the river for a livelihood, and who were known as flat-boatmen. Generally they were perfect types of physical manhood. Men of nerve, and by their occupation innured to endurance and hardships. at that period the business of transporting goods by means of flat-boats was more extensively engaged in than now, and it was not uncommon to see a dozen or more of this kind of water craft afloat in mid stream or lying at the landing simultaneously. Mt. Vernon was noted abroad as a place that claimed, as her residents, a number of hard "cases." There were not what is known as desperadoes, but merely men who would not scruple at running horse races, playing poker or indulging in fisti-cuffs whenever the opportunity was offered. It was some time in the year 1834 or '35 when several crews of flat-boatmen were on their boats at the landing at Mt. Vernon, and when the idea occurred to them that it would be a source of amusement to "turn up the town." The first place they stopped was at the saloon kept by John Carson, on Water street. Directly opposite this dram shop was a cooper shop, owned by John Cooper, in whose employ were several men, who were not averse to "sport" and who soon joined the flat-boatmen, with whom they tapped glasses and drank frequently. The drinking continues until a general fight ensued, in which the coopers were badly beaten. The news of this defeat and outrage came to the ears of the rough element mentioned,a nd to avenge the wrong perpetrated upon their fellow citizens, they congregated in numbers at the cooper shop, equipped themselves with hoop-poles, and accompanied by the bruised and bleeding coopers, attacked the flat-boatmen. It is said that the combat was a long and bloody one, the chances being equally divided between the belligerents; brick-bats whizzed through the air and hoop-poles were brandished and fell relentlessly upon the backs of the invaders like the wrath of the avenging angels. Evidences were finally shown that the river men were weakening, though this end was slow to come about. The citizens were not slow to discover their condition, and they charged the enemy furiously, who began a retreat, which terminated in a complete rout. The water men beat a hasty retreat, pursued by the incensed "land lubbers" to their boats, which they quickly unloosed and pushed into the stream. The victory was a glorious one and the reputation of the village for fighting men was grandly sustained. The boatmen, with swollen noses and blackened eyes, were carried away on the majestic bosom of the Ohio to the sunny clime of the South, where the balmy air is healing and where dreams of happiness "dance o'er the mind". They passed and were passed in turn by flat boatmen; their unsightly appearance elicited inquiry and inquiry produced facts; facts that confirmed the prevalent idea that "they were a bad set at 'Vernon". whenever a man on the rivers, after that event, was seen with a damaged facial member, a broken nose or a "mourning" eye, he was accosted with: "Been to 'Vernon, pard" Hoop-pole township, Posey County is a hard un, ain't she?"